Dr. Salman Tariq did his B.S. and M.Phil. with distinction from the Department of Space Science, University of the Punjab, Lahore. He did his Ph.D. in Space Science in 2017 and earned a credit for being a first faculty member having PhD in Space Science. He joined Department of Space Science as Research Scholar in December 2010 and currently serving as an Assistant Professor in the department. His major research domains are climate change, atmospheric science, remote sensing and GIS. Twenty three (23) of his research papers have been published in foreign peer-reviewed impact factor journals during the last three years. He has also contributed a chapter in a book entitled “Land-Atmospheric Research Applications in South and Southeast Asia” published by Springer International. He was invited by the French Government on a fully sponsored official visit to France in the framework of its programme “Make Our Planet Great Again”. This programme in connection with Paris Climate Agreement has recently been announced by the French President to invite outstanding scientists to France for collaborative research work on climate change. In 2014, he was selected twice as Young Scientist by Chinese Academy of Sciences and World Meteorological Organization (WMO) to present his research papers at Monsoon Asia Integrated Regional Study (MAIRS) Open science conference held in Beijing, China, and World Weather Open Science Conference in Montréal, Canada. In 2016, World Climate Research Program (WCRP) and WMO selected him as an Expert Scientist to present his research paper at CLIVAR Open Science Conference in Qingdao, China, 2016. He was selected and financially supported as Young Scientist by Inter-American Institute for Global Change Research (IAI) and the INterdisciplinary CLimate INvestigation cEnter (INCLINE) to present his research findings at “São Paulo School of Advanced Science on climate change: Scientific basis, adaptation, vulnerability and mitigation” held at São Paulo, Brazil in 2017. 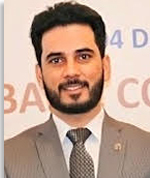 He is active reviewer of various international peer reviewed impact factor journals such as International Journal of Climatology, International Journal of Remote Sensing, and Environmental Pollution.